This summer has been a series of disasters. First my back goes out in a horrible way (ooo the pain), then my insurance won't pay for the six weeks of physcial therpy it took for me to claw my way back to being mostly not in pain, then today we had to replace our air conditioner with a new unit after it died a harsh death on Monday night. (It's been 104-110 out here, so going without isn't an option). And then my husband--let's just say he'll be starting another job in a few weeks. Writing books in the last two months has definately been a challenge! The physcial therapy helped wonderfully, taught me much about how to take care of my body and how to grow strong, and restored my faith in the kindness of others. We had the money set aside to pay for the AC, so while we are unhappy about it, it didn't devastate us. And we knew that unit was going to go, it was just a matter of time. Hope everyone's universe is doing ok for them! First--work update: Halfway through revising The Calling, and started on the black dragon's book (not sure anyone out in bloggerland cares, but reports keep me on target). Recently I've been doing surveys and interviews in which one of the questions is about "how" I write. Everyone is fascinated by the writing process, and I confess it's interesting to learn how an idea travels from the author's head to become a finished novel. I can't help feeling, though, that some people are searching for the "secret" to writing a novel, or worried that they're writing the "wrong" way. Well, there isn't a secret or a right way. The secret is (drumroll): Whatever works best for you is right. So newbie me (I knew nothing, remember) spent copious hours trying to figure out how to outline and how write to it. What a waste of time! I never managed to do it. I write much better visualizing the story in my head (for months beforehand) and then making up the details as I write the draft and revise it. I can do a vague plot outline if I'm lucky, but I simply am unable to note every detail of a book before I start. After I got published (writing my way), suddenly everyone told me I wrote "organically," "from the inside out," and "by the seat of my pants." Because a few mega-bestselling authors came out and confessed that they never used outlines, suddenly the trend reversed, and being a "pantser" became the thing. Now some plotters (those who meticulously outline) are nervous that their method is somehow wrong and inferior. Guess what? Neither way is right!! Neither way is wrong, either. Some authors (for example, Diana Gabaldon), write scenes completely out of order and link them together just before turning in the ms. Some authors write the last scenes first. Some write linearly, beginning to end. And no one is right. What you do is pick the method that is right for you. Don't EVER let anyone tell you your way is wrong. If it works for you, stick with it. If your method isn't satisfying you, play around with other methods until you find one you like. There are no hard and fast "rules" in how to write a book. You can't even say "have a beginning, middle, and end" because many literary novelists bend rules and timelines and have endings that you aren't sure are really endings. The good thing is, editors and readers are interested in your end product. If they want to know how you got there, it's because of curiosity. They care about your book, and will have no idea whether you spent months writing an outline or made it up as you sat at your keyboard. If they love the story enough, they won't care, either. I spent a day in Sedona not long ago and communed with nature, so that helped. Went to the new age store and indulged in crystals. It's funny how the minute I walk into that store I'm immediately pulled to the stones and crystals. They sing to me, I guess. Found a nice peice of amber to go with my character, Amber, in the upcoming Immortals series. For inspiration. The book is shaping up nicely and will go to my editor soon. I have to say that writing paranormals (both contemp. and historical) has me researching varied and interesting things. In the last year I've immersed myself in Greek mythology and history, Greek archaeology, Chinese history, Wicca and magick, Egyptian mythology, Eastern European history, crystals and stones, and Las Vegas. Never let anyone tell you that only historical authors do research! 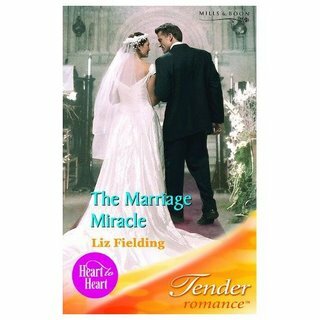 I was very pleased that this book won a Rita--The Marriage Miracle by Liz Fielding. This is its UK cover, you can find it on Amazon with a US cover. I had this book in my stack to judge in the preliminary round and just loved it. It has a good British romantic comedy flavor, and I busily cast Colin Firth or Colin Ferrel in the lead. It's about a British businessman who is very successful in New York, then finds he's inherited a greeting card company on its last legs from a rakish uncle back in England. How to pull the business back together--without firing the staff who have become as close as family? Enter the heroine with her unique paintings for children's books, but she has a problem--she's now confined to a wheelchair. Does that stop our hero sweeping her off her feet? Of course not! Throw in the hero's quirky family, the secretary at the greeting card company, and some funny banter and tension between hero and heroine and you have a touching, very realistic story that I seriously think would make a great film (are you listening, producers?). As for my own work--I'm going flat out as usual. I finished the first draft of the Immortals--THE CALLING Woo hoo!! and am now turning to write dragon book number 2 for Berkley. I'm right on my own schedule, despite the back problems, so I'm pleased. More on all this anon.